Zeal for the Code is important. There's not much use for lukewarm followers of the Code. Those who lack commitment are apt to find "exceptions" where someone should not have to play by the rules. 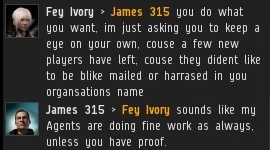 Fey Ivory came to me with concerns about members of his corp being targeted despite being new to EVE. Fey was so protective of his corpmates that it made me curious what corp he belonged to. 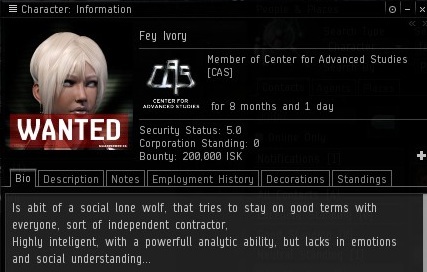 Bizarrely, Fey was actually a member of an NPC corp.
Fey claimed that new players lacked isk and could not afford mining permits. This is nonsense, because mining in highsec is a privilege, no matter how new a player is. There's always a way to make money. Are there no Level 1 missions? And the ore belts in rookie systems--are they still in operation? In any case, lowsec, nullsec, and wormsec are available to all players, even if they have only just completed the tutorial. They may get killed, but that's part of the game, and rookie ships are free. 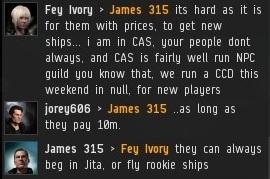 I didn't buy Fey's assertion that new players are entitled to something better than a rookie ship. Why are they called "rookie" ships, then? And why would CCP go to all the trouble of redesigning them if new players are too good for them? Still, Fey wanted his NPC corp to receive special treatment. 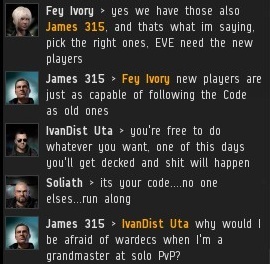 Regardless of corp, alliance, coalition, or faction, all who enter highsec agree to obey the Code. I play fair; I play by the rules. There's no partiality or bias with me. Everyone must follow the law in highsec. Nor is there any bias based on how old or new a player is. Ideally, every player should download a copy of the Code and read it before they log into the game for the first time. I'd like some New Order content to be added to the tutorial, but so far CCP has resisted doing this. As months go by, I'm never not amazed by the excellent conduct and comportment of my Agents. Fey Ivory appealed to the discredited philosophy that new players are more valuable than other players, and that we should take desperate action to attract and retain them--even at the cost of EVE's soul. Avensys became alarmed by the conversation he witnessed in local. Everyone ignored him. Once we understand that we shouldn't compromise the core of the game to accommodate random people on trial accounts, we must come to the conclusion that new players should assimilate into the culture of EVE, not the other way around. In a dark corner of local, Avensys continued to be appalled. People sometimes ask me how it feels to know that people are killing others in my name. Take a wild guess. It feels good. This reminds me... If anyone has the ability to upload documents to a university server, please convert the Code into a PDF and post it up. Perhaps then people will recognize its scientific merit. I couldn't figure out, why was Avensys so emotionally wracked that he couldn't comprehend simple and basic English words? Why was he constructing an elaborate fantasy about racial purity programs? Then I saw it, in his corp. history: 6 happy months in CAS, and years afterward yearning to return, yet blocked and continually relegated to The Scope with every attempt to return to its beneficent fold. Avensys is a broken man, my friends, lost and heart-torn. It was Fey who brought "blood" into this conversation, and it was figurative "blood" anyway. In James' response, he even iterated that it is the failure of the miners to simply follow the Code and be civilized that dooms them to bump - their lack of merit, not anything to do with their genetics. Guess it's too much to ask of the rebels to learn to read before addressing our Savior. I will terminate code-violating carebears in your name for the duration of our thousand-year Reich, Supreme Protector. Yawn. Why don't you stop hiding behind your mothers/fathers skirt and post with your character. Or you too afraid we'll gank you too? In a way or two, I agree with Avensys. But then again, despite me not liking this whole zealotry from the whole cult of James 315, the Code in that no one should bot or go AFK over longer periods of time is a good thing. Though meh, not like any of this actually affects me in any way shape or form. Do you think is wrong to state that EVE is not for everyone and that some people will find out after trying it that it's not the game for them? Because that was the real issue discussed, Avensys failed to understand that and started rambling about genetics nonsense. Some people will find any excuse, no matter how tenuous, to take umbrage and play the white knight. I just don't really care about other players in the game or their feelings. 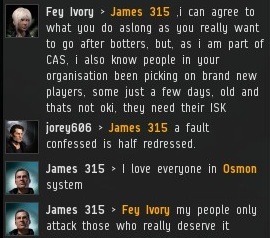 It's easier to earn ISK by not caring and just looking at everything as a number rather than a personality. If this was another game however, MAYBE I would care...such as if Guild Wars 2 had any real ganking in world PVP, which of course is non-existent. I began my EVE Career in the Center for Advanced Studies. I left two or three days later to join my first player corporation, then busied myself with probing for worthless gravimetric signatures, spelunking into wormholes, getting involved in corp drama, dodging war targets, wandering into lowsec despite my CEO's admonitions not to. I joined EVE with the intention of being a miner, but I never did much mining beyond the tutorial. My scout alt mines all the time ... usually right next to the targeted Orca. "And the ore belts in rookie systems--are they still in operation?" Send knights out to these systems to go after these non-rookie miners who empty out these systems so fast. This helps to teach the new players about the New Order, as they learn about it from local; frees up all the stuff in the belts for said new players; deals with longer-in-game players who gravitate towards these safer systems, which surely is a sign of bot-aspirancy. Ganking in rookie systems sounds like a good way to get banned. It's very easy for new players to mine with a great deal of safety, by running low level security missions, and then stopping to mine those missions which contain large ore belts--these mission belts are fairly common. Or, they can just run mining missions, which pay fairly well right now. Any miner who chooses to go to belts instead of these options has chosen to go to a very public place: which I applaud, as interaction is the soul of EVE online. 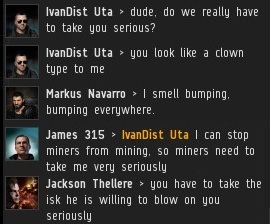 If I can't gank in rookie systems (and I agree with that wule), why should I be able to mine there if I'm not a rookie? I agree that rookie systems should be for rookies only. Rookie systems should be for rookies only. You are probably allowed to gank there, so long as your target is not a new player (character is older than some minimum), just like you can pursue and engage war targets in a rookie system. Still, all rookie systems are 1.0 sec and ganking there isn't really worth it, especially when there are so many other targets in lower security systems. If asteroid belts in rookie systems are really depleted by non-rookies (I don't know personally as I don't go there), shouldn't that considered like ganking rookies? You're damaging them. If the rules are there to protect their first days experience, what's the difference? "Rookie systems should be for rookies only." I don't disagree with this, but that subject has already been debated to death, and it mooted nothing. "You are probably allowed to gank there, so long as your target is not a new player (character is older than some minimum), just like you can pursue and engage war targets in a rookie system." What's that minimum? Again, I don't disagree that this *should* be the case, I just don't see this as an area to test CCP's willingness to swing the banhammer with random experimentation. Devil's advocate: you gank a 2008 character in a rookie system. Said someone petitions CCP, said they hadn't played in a long while and were back to "rookie" status as a result of said inactivity. 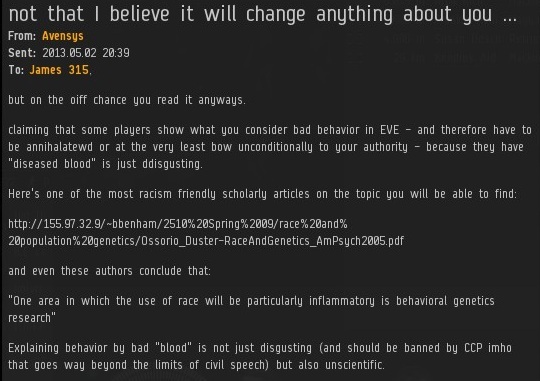 CCP bans you. I fully believe that CCP would do this, and I would never gank anyone of any age in a rookie system until CCP specifically says they would not do this. Whatever though, it's your account, if you want to be the test case for that scenario, go right ahead. "If asteroid belts in rookie systems are really depleted by non-rookies (I don't know personally as I don't go there), shouldn't that considered like ganking rookies? You're damaging them." 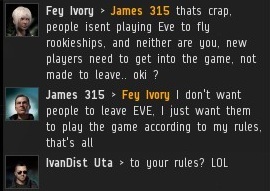 There's no way to completely isolate rookies from the potentially deleterious effects of other players' actions in EVE, even if the rookies confine themselves to rookie systems. Unless you moved the rookies to a separate shard/instance. For example, some players will sell particular items (items needed to complete certain rookie missions) at inflated cost in rookie systems. That said, I agree that it's silly for non-rookies to be mining ore in a rookie system - I just don't see how to curtail it, beyond removing all non-mission-related ore entirely from those systems. "What's that minimum? Again, I don't disagree that this *should* be the case, I just don't see this as an area to test CCP's willingness to swing the banhammer with random experimentation." I don't know the minimum - I used to know, but I forgot. To my (fuzzy) knowledge, there *already is* an established minimum age, after which a character is no longer considered 'new', and therefore no longer given special consideration. Excessive hostile actions (can-baiting, etc) against a 'new' character in rookie systems (as well as Sisters of EVE epic arc systems) was against the EULA. I agree that random experimentation is unwise - I believe there are several past cases of enforcement that we can examine to inform our decisions here, if we were so inclined. But as I already stated, ganking in 1.0 rookie systems isn't really worth it. 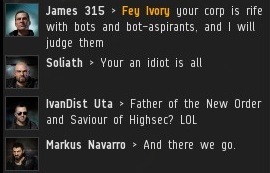 CCP decides upon petitions about non-rookie ganks in rookie system ganks on a case by case basis. For the most part the rule about rookies is this: it applies only for rookies. For clarification the rule is: Do NOT mess with newbies in the starter systems. Anything that can be construed as bad being done purposefully to a newbie in a rookie zone by an experienced player is a sanction-able event. That does not include returning players. But, if ever there is a system where one has to be really careful about this kind of thing it is in the starter systems. Because a GM just might come down on the ganker. 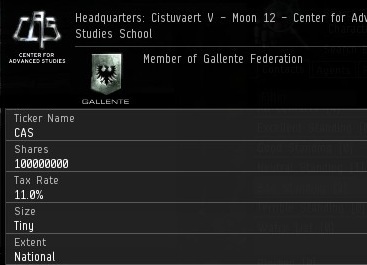 I've seen a lot of people claim that someone has quit from EVE due to the New Order but I have never, not once, seen proof of this claim. I have seen an awful lot of, "I heard of someone from someone else's friend in a corp" but never any direct proof. Typically, if people quit a game due to something bad happening to them you will get at -least- one post whining that it was the reason they quit somewhere. Usually the whining / noise about the New Order is made by experienced players who aren't quitting over it. But we do know, as a fact, that there are players who have started characters in EVE because of the New Order of Highsec. Belt depletion in rookie systems is usually caused by all the Ventures hitting the one belt in the system. A Venture is damned near as efficient as a barge. It's the rookies doing most of that belt clearing. But feel free to nuke a Retriever there if you can ... a rookie isn't piloting one. This honestly puts me in a weird spot, being both a permit owner slash shareholder and a member of CAS. 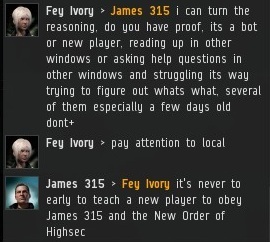 On the one hand, I can understand why Fey would be concerned about new players being educated by our agents. To put it honestly, EVE as a whole for a new player is like learning to swim in shark-infested waters after someone dives in with a paper cut. On the other hand, even someone who's only been in the game less than a day can pull this site up and learn something very useful for survival while they're still green and end up all the happier for it. Plus, CAS does have a few agents and at least one shareholder who can answer questions about the Code in a way they can understand. If some of the veteran CAS members join me in explaining the Code in easy lessons for new players, that would take a LOT of work off the hands of a very understaffed school. Trial accounts can't transfer ISK, so they can't directly buy a permit. As a shareholder, I think that the new order should inform aspiring miners with a trial account of the rules they have to follow in hisec, and give them until the end of their trial to raise the money, as long as they comply to the code during that time. Of course, if they are caught AFK mining then they should be bumped/ganked as usual. Trial accounts are in the best position to learn to be compliant. If they lose their Venture due to a lack of a permit, they can get a replacement by doing ANY industrial career agent from any faction. Gank them now while their losses are cheap. They will learn the value of a permit tank before they buy a barge. You do them no favor by withholding proper highsec discipline while they arein their formative months as a player. Well said Agent Trask, I think I'll go kill some noobs.